Ad Spend On SMS Marketing Is Phenomenal! SMS marketing is like a runaway train. Nobody knows when marketers will hit the brakes, but SMS messaging ad spend is forecast to hit the $65.87bn by 2019. The positive growth in SMS marketing is fuelled by the increase in online mobile users. Digital advertising is expected to reach a whopping $570.4 billion worldwide this year in line with the 4% year-on-year growth pattern. US firms that are spending the most of any country on SMS marketing and research analysts at Techavio expect the trend to continue. The firm predict ad spend on mobile marketing will post a 10% increase of compound global growth with the States contributing towards 7% of the evolution. Firms in North America are having a positive reaction now the economy is showing signs of recovery. The outlook for growth is set at 5% and is counter-acting expectations following the election of Donald Trump to the White house. But markets are showing signs of easing too. In Asia Pacific, the buoyant markets in India and China continue to lead the way and even though the latter slowed to a 5.7% increase last year, the People’s Republic is still the world’s fastest growing market. Overall, markets in Asia Pacific are still predicted to enjoy a healthy rate of growth. A predicted 4.2% for the region has a positive outlook following last year’s growth rate of 3.9% thanks to the emerging markets in Philippines and Vietnam. SMS messaging has become a firm favourite with advertisers. Texting has a powerful reach. Over 90% of text marketing messages are read within 15 minutes. But SMS is also a useful stepping stone that firms are benefiting from to help guide customers to product pages. And this is why ad spend in the US soars during major events such as the Super Bowl and the Presidential election. As a matter of fact, mobile marketing is the biggest driver of digital ad spending. Since Google announced that more people are conducting searches on mobile phones than desktop PC’s, marketers have been focusing on producing mobile marketing campaigns. As mobile technology improves, marketers have more opportunities of reaching your audience through mobile channels. Marketers need to be where buyers are hanging out. Search engines are adjusting their algorithms to cater for mobile users. Towards the backend of 2016, Google announced it will be replacing the current search index for a mobile-first index (MFI). Comments made by the firm indicate the MFI will eventually replace the current search index which is designed for desktop users. There is even talk of search engines becoming mobile-only. 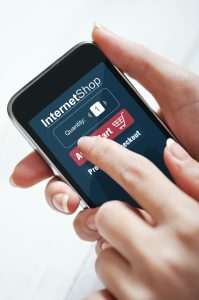 Social media networks have been a driving force behind the increased use of mobile internet users. SMS marketing is also muscling in on the power smartphones offer – power which presents business owners with remarkable opportunities to connect with your audience. The growth of SMS marketing is not showing any signs of slowing. Shoppers are also warm to the idea of receiving text messages from brands. 9 out of 10 consumers want to text with brands! How using SMS for marketing can and will make your business grow.